If you have just got engaged and are starting to plan your wedding, one of the first things to decide upon will be where you get married. For several decades, the proportion of marriages in religious ceremonies in England and Wales has decreased and the proportion of civil ceremonies has increased. By 2011, less than 30% of marriage ceremonies were religious. The Marriage Act in 1994 increased wedding diversity, allowing thousands of venues from Arsenal’s Emirates Stadium to One Mayfair to give couples even more to choose from. The choice was no more between church and drab register office. And a licensed wedding venue can easily accommodate ceremony, reception and wedding breakfast, where a church cannot. But in the last few years, the proportion of church weddings has started to increase. In difficult times, no matter how devout the bride and groom, the big moments in life seem more significant when celebrated in church. If one of your grandparents was married in the church, you also qualify. If you feel ready to speak to the vicar, read on! Go to www.yourchurchwedding.org and read up! 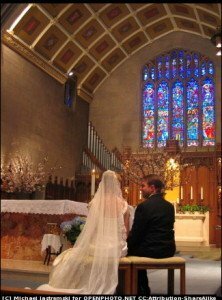 Make a list of things important to a church ceremony – will you need an organist for hymns, bellringers, confetti? Decide whether you are going to invite the vicar to your reception! Think carefully about your journey from ceremony to reception venue – and your guests’ journeys too!